Everyone wants to be happy. Whether it comes from fulfillment in our work, contentment in our relationships, pride in our children, or passion in our hobbies, we all strive for happiness in our lives. Sometimes we spend a lifetime searching for it. We set goals for ourselves—a nice home, a perfect spouse, the ultimate promotion. When the goals are achieved, we experience joy and satisfaction; but the happiness is fleeting, short-lived as we set more goals and decide we’ll only be truly happy after these new goals are met. No matter how much we earn, no matter how much we have in the bank, no matter how nice our clothing or car or house or toys are, it’s never enough. We’re not satisfied with what we have . . . we want more . . . and happiness, like an elusive butterfly, is always fluttering just beyond our grasp. Sad, but true, it can take decades of pursuing happiness before a person realizes it can’t be measured in money or material things. Happiness is more a state of mind—a general feeling of well being, contentment, and satisfaction—than the temporary joy a person experiences when something wonderful happens. Choosing to be happy is a positive approach to life where you consciously take action to (1) do the things that make you happy, (2) be with the people who make you happy, and (3) be happy with the person you are. Love yourself. Inner peace is the key to happiness. When we are content and comfortable with who we are and are at peace with ourselves, love and happiness radiate from within and touch every phase of our lives. We have better relationships, more successful careers, greater satisfaction and overall pleasure, and are able to cope more easily with the wicked curves life sometimes throws. Optimism and self-esteem are always present in happy people who lead happy lives. Cultivate your strengths, your talents, yourself. Affirmation: I am a wonderful person with a lot to offer. Cultivate relationships. We all have a basic human need for close, intimate connections with other human beings. Good and supportive friendships, a strong marriage, and loving relationships with family members increase happiness. Make it a priority in your day to set aside quality time with those people you love. Call or visit those you see only once in a while. Seek out new friendships with those who have like interests. Connecting with others enriches our lives in meaningful ways. Be present. Don’t think about how great things will be in the future. Don’t dwell on what did or didn’t happen in the past. 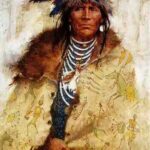 The past is only important inasmuch as it explains where we are in the present. Learn to exist in the here-and-now. Experience and enjoy life as it is happening. Appreciate the world for the beauty that it is . . . right now. Instead of waiting for big things to happen—marriage, kids, house, nice car, big promotion, winning the lottery—find happiness in the simple pleasures that happen every day. A cup of coffee in the quiet morning hours. Juicy, fresh-picked strawberries. Ducks playing in the icy pond. The pleasure of reading a good book. This takes some practice, but it’s all about stopping to smell the proverbial flowers. If you Slow Down to Savor Life, you’ll be more aware of the world around you, come to appreciate the simple pleasures, love life more, and feel happier and more content. Do what you love. Life is too short to waste time doing things you don’t enjoy. Determine what 4-5 things you love doing most—things that are essential in your life and bring you the most happiness—and do them. Make these things the foundation of your day . . . every day. Focus on them, make them priorities, and eliminate as much of the rest as possible. Finding simplicity in the daily chaos of our lives reduces stress and clears the clutter so we can focus on what’s important, create something amazing, and find time for happiness. It might take a while for you to get down to your essentials, but it’s worth the effort. Think positive. Everyone’s life has positive and negative aspects. 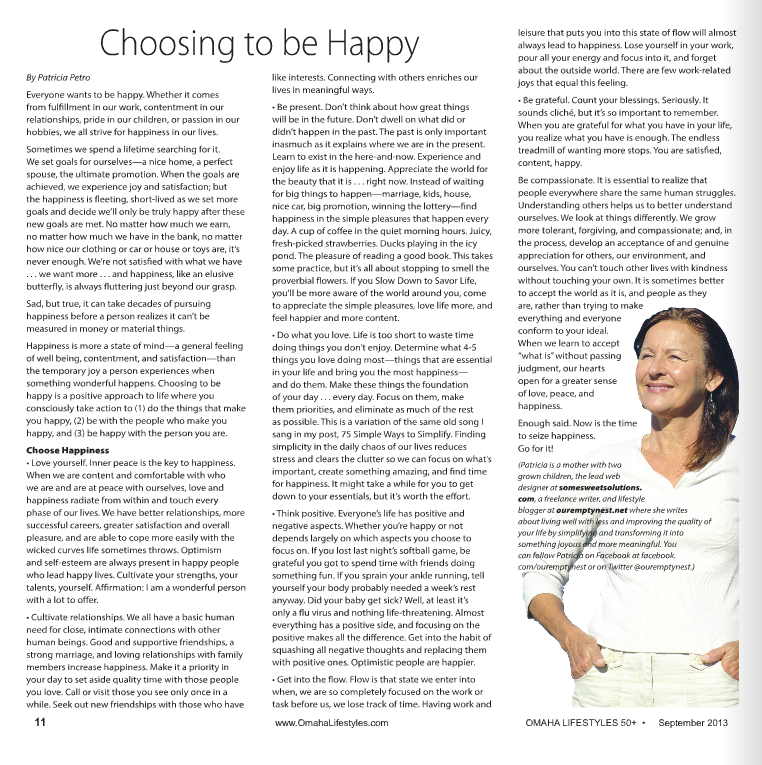 Whether you’re happy or not depends largely on which aspects you choose to focus on. If you lost last night’s softball game, be grateful you got to spend time with friends doing something fun. If you sprain your ankle running, tell yourself your body probably needed a week’s rest anyway. Did your baby get sick? Well, at least it’s only a flu virus and nothing life-threatening. Almost everything has a positive side, and focusing on the positive makes all the difference. Get into the habit of squashing all negative thoughts and replacing them with positive ones. Optimistic people are happier. Get into the flow. Flow is that state we enter into when, we are so completely focused on the work or task before us, we lose track of time. Having work and leisure that puts you into this state of flow will almost always lead to happiness. Lose yourself in your work, pour all your energy and focus into it, and forget about the outside world. There are few work-related joys that equal this feeling. Be grateful. Count your blessings. Seriously. It sounds cliché, but it’s so important to remember. When you are grateful for what you have in your life, you realize what you have is enough. The endless treadmill of wanting more stops. You are satisfied, content, happy. Be compassionate. It is essential to realize that people everywhere share the same human struggles. Understanding others helps us to better understand ourselves. We look at things differently. We grow more tolerant, forgiving, and compassionate; and, in the process, develop an acceptance of and genuine appreciation for others, our environment, and ourselves. You can’t touch other lives with kindness without touching your own. It is sometimes better to accept the world as it is, and people as they are, rather than trying to make everything and everyone conform to your ideal. When we learn to accept “what is” without passing judgment, our hearts open for a greater sense of love, peace, and happiness. Happiness Tip: Smile at a Stranger — We should all smile more often, in general. Just the simple act of smiling or laughing can make you happier. But even better, smile at a stranger…. In most cases, you’ll get a smile in return. The more you smile, the more smiles you’ll see in return. End result? A happier world. So simple! —Leo Babauta, Zen Habits. Enough said. Now is the time to seize happiness. Go for it! 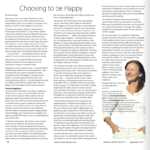 “Choosing To Be Happy” was featured in the September 13, 2013 issue of Omaha Lifestyles.